Investors around the world predicted that gold prices would drop during the latter half of 2016; what’s really happening? Supply and Demand: There is a reason why this fundamental is taught on day one in most macroeconomics classes – it is the driving force behind virtually all market price fluctuations. Gold is currently suffering on the supply side with large central banks buying gold by the ton. In fact, banks bought up nearly 140 tons of gold in 2015, which amounts to a large percentage of the gold sold worldwide that year. Moreover, banks aren’t selling much of it, which points to a “hold it ‘till it’s worth more” strategy that certainly says something about the future outlook of gold prices. Consumer demand is strong: India imported about $5 billion in gold in 2015 versus just $2.06 billion in 2014. Worldwide mints are reporting record sales, too. The U.S. mint is on pace to sell more gold this year than in any other year since 2011. The Royal Mint in the U.K. and the Perth Mint in Australia are also reporting that demand is strong. China is importing gold at a record pace with nearly 10% of the gold mined in 2015 consumed by the nation. The central banks aren’t the only ones enamored by gold. Consumers are also investing in gold in increasingly larger amounts, again pointing to the confidence in a near-term upside. Gold will counterbalance low rates: Gold doesn’t produce any income until it is sold, but many other investment options that pay a dividend or are reliant on interest rates to drive profits are struggling right now in our low spread economy. 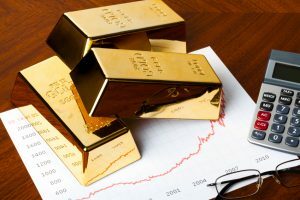 Investing in gold is an incredibly effective hedge against equity risk, credit risk, and a low rate environment that may stifle profitability over the next few years. Buying gold is the antidote to market volatility, and there is serious opportunity in the market today for those considering the yellow metal in place of more tempestuous equities. Gold prices in 2016 have fluctuated a bit, but consumers saw sub $1,100/ounce spot prices early in the year, with gold closing at more than $1,300/ounce as of early September. All indicators, both external and inherent to gold as a commodity, point to 2016 to be quite bullish in terms of gold prices.